I must admit that for new recipes, I’m diggin’ Pinterest. That’s where I found today’s little bit of healthy tastiness: watermelon frosty! The recipe actually comes from Healthy Happy Life, where they also give instructions for making it a margarita. No ‘ritas here. I bought a watermelon and had planned to just snack on half of it and freeze half of it for this recipe, but turned out not to be a great melon, so I chopped and froze the whole thing. Learn from my mistake: if you chop up a watermelon, put all the pieces in a bowl and stick it in the freezer, you end up with one large block of watermelon pieces all frozen together. Put it all in a blender. That’s it! The original also suggested that juice from two limes would also be tasty. I’d like to try that. Obviously, if you don’t like watermelon, you’re not going to like this recipe. I didn’t taste any banana, but I like bananas. If you really don’t like bananas, you might be able to taste it? I also tried it the other day just watermelon and water, and this recipe was far superior. Also, unrelated, today’s post is the last one with “Meatless Meals…” as the title. In the future, I’ll include the title of the recipe in the title of the post. More user-friendly. If I have insomnia and need something mindless to do, I’ll go back and change the rest of them … but don’t count on it. Just wanted to take a moment to say hello and thank you to the subscribers who have stuck around even though posting has gotten thin. I fully expected to be up and running by now with at least a couple of posts per week, but as it turns out, we got a child who takes power naps. Just enough time for mom to grab lunch, or empty the dishwasher, or hang the laundry (but not all three!). I have a recipe for you tomorrow, a few posts lined up for you next week, and of course, Nichol is sticking with us on Wednesdays. Are you enjoying following her journey in real time? Has her mile-a-day inspired you to get up and get moving? I also have a couple more book reviews coming up for books you might like. So hi 🙂 Thanks 🙂 See you next week! A link passed through my Facebook feed the other day: 50 Seemingly Healthy Foods that are Bad for You. Besides my annoyance that it was a 51-slide slideshow (how many clicks…), I was annoyed at some of the items on the list: energy drinks? Gummy fruit snacks? Really? And granola, while something that actually should have been on the list, was on there in three different forms (granola, granola bars, parfait). But this post isn’t about whether or not those 50 (or 48) things should have been in the too-many-clicks slideshow. Low fat/fat free/low calorie/”light” foods: When they take out the fat or calories, they put something else in it to make it tasty. Generally, the replacements are worse than the fat was to begin with. Either take a small portion of the full-fat version, or skip it altogether. Foods that can be cooked in their container: Most of these foods are TV dinner-type foods, which tend to be unbalanced (how many green veggies?) and full of sodium. Even the ones that are healthier (and others that aren’t in mini cafeteria trays) are still in containers that leech chemicals into the food. Sure, they’re convenient, but at what cost? Any “health food” that has candy added to it: trail mix, granola, yogurt, etc. A handful of nuts and no-sugar-added dried fruit is a healthy snack. Add M&Ms and coat the peanuts in chocolate? Not so healthy. Any “health food” that is flavored: milk, non-dairy milks, and yogurts are the most common. You’re much better off buying plain and adding your own fruit or other flavoring. The pre-flavored varieties are loaded with sugar. Chips: doesn’t matter what they’re made from or if they’re baked or fried. Some are healthier than others, but none are health food. Anything fried: you’d think this goes without saying. Fish is healthy (generally). Fried fish is not. “Special diet” processed foods: gluten-free, vegetarian, vegan, dairy-free, etc., etc. Food is not inherently healthy just because a particular ingredient is missing. Canned food: besides the chemicals in the lining of the cans, most canned food has either too much salt or sugar in it. Opt for frozen instead, if you have the option. Sports drinks: you need to exercise at a high intensity for a long time before you need to start to worry about your electrolytes. Organic junk food: just because it’s organic doesn’t mean it’s healthy. Produce, meats, dairy? Yes. Cookies, cakes, candy? No. Protein bars and shakes: most of them have a lot of sugar. And if you’re eating a remotely typical American diet, you’re getting more than enough protein. What foods were you surprised to learn (today or ever) are not as good for you as you thought? Posted by nicholh in exercise, food, Nichol, weight loss. Comments Off on I’m Back! Wednesday + Nichol = blog post! I’m back. Physically. Mentally, I am very much still on vacation. I’m feel okay with how my healthy lifestyle fared in vacation. I ate things that I don’t ordinarily eat, but it was definitely in moderation. I ate French fries, and dipped them in ranch dressing. I ate a burger. But the most sinful thing I had? Chicken parmesan. My favorite Italian food meal and a ridiculous load of cheese and sauce and pasta and. . . my mouth is watering. As for my mile, I got it in everyday. We walked a lot on vacation, as my family invariably does. I definitely got in more than my fair share of miles last week. I don’t have any amazing updates or new parameters I’ve set on myself. Right now, it’s really more about making sure I get back into eating and miles ASAP. I don’t want any leftover vacation eating sneaking up on me. “Nanny State” or Protecting People? Nichol is on vacation this week, so I thought I’d toss out a conversation piece. I just read this article about a town in Washington that got rid of its bicycle helmet law due to financial considerations. I came across it via Facebook; a page I like posted it. After I read the article, I read through some of the 75 comments. People argued both sides of the helmet debate (for or against laws, with some really interesting perspectives on both sides), but everyone agreed: it’s just plain stupid not to wear a helmet when you bike. Some people cried “nanny state!” Another posted a link with this summary: 91% of cyclists killed in accidents in 2009 were not wearing a helmet. I don’t know the helmet laws here in sunny Arizona, but I never bike without one. I do know there are no helmet laws for motorcyclists, so I assume there aren’t any for bicyclists, either. (It is disturbing to see people on motorcycles on the freeway with NO protective clothing on: shorts, T-shirt, sandals, no helmet.) I was in a biking accident a while back. (Look before you turn, people!) The pavement and my helmet mingled better than the pavement and my head would have. What’s your opinion? Are helmet laws helping to keep people alive, or are they just another tentacle of “the nanny state”? That’s what I weighed this morning when I stepped on the scale. The last few days have been between 136 and 138, so that’s my starting window. It’s time for the baby fat to go. 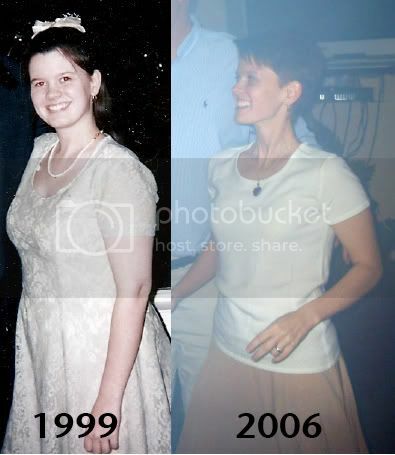 When I was pregnant, I had plans for losing the baby weight after The Kid was born. What I didn’t take into account was milk supply. To put it mildly, nursing was … difficult at first. Once we hit a good groove, I went back to teaching (thankfully only part time) and needed to pump. Through all of this, The Kid has been a very enthusiastic eater. It was really important to me to keep up my supply, so I didn’t focus on cutting calories. There was time later for the fat to go. While I am using the scale as a tool, it’s not my end-all-be-all. 120 is my target, but really, my pre-pregnancy clothes need to fit. My arms need to not jiggle. And you need to be able to see my abs. Those were all in place prior to the baking of The Kid. Here’s the thing, and if you’ve ever gotten into a habit and had it thrown off, you know this already: getting back into the habit of eating well and exercising is hard. Yep, it’s hard for me, too. There are an awful lot of people who think that these things come easily to me. False. That said, once I’m in an exercise groove, once I’ve kicked the sugar cravings, then it’s easy. But if you could get there, it would be easy for you, too. It’s getting there that’s hard. My advantage right now is that I know how it feels to be on the flip side, to crave vegetables instead of cookies, to be able to tell from my body and not the calendar that I didn’t exercise yesterday. It feels amazing. Energy, clarity, stress levels. a-MAZ-ing. Worth it. Oh, and it’s healthier. OK, so we’ve established that I’m human and that I’m a step beyond “soft.” What am I going to do about it? I am running accountability groups, but I see those as something to manage, not something to participate in. My external accountability will be here, on the blog, but that’s just motivation, not a plan. I already registered to do a triathlon in October, which means I need to train. But that’s not a plan; that’s just motivation. 2- Plan meals better. The Big Man and I are pretty good about planning dinners for the week on the weekend, shopping for whatever we need on Sunday or Monday, then following through. What we don’t plan, and where I get stuck, is lunch. I hate lunch. I wish I didn’t need to eat in the middle of the day. But I do. So I’m going to do better in planning lunch, which will give me the fuel I need to exercise in the morning and also allow me not to be famished (and overeat) at dinner. What I think I’m going to do, though I haven’t given it much thought yet, is to incorporate a “rainbow” into my lunches, so no matter what we have for dinner, I’ve already covered the spectrum. In a nutshell, Unjunk Your Junk Food presents nutritional information about junk food. The authors of this book want people to understand that cravings for these kinds of food are understandable, and that it is possible to make better nutritional choices if a consumer understands the health and nutritional impact of ingredients used in junk foods. Unjunk begins by introducing the keys to understanding nutritional information. It teaches the reader how to make sense of food labels; the basics of nutritional science and health; and the worst ingredients found in junk foods. How to eat the proper amounts of carbohydrates, protein, fats and the other elements of foods’ make-up is also covered extensively. The section on the worst ingredients points out a lot of important facts about items such as trans fats, sugars, artificial sweeteners, sodium and additives such as artificial flavors and colors. The authors pull no punches when talking about the negative effects of these worst ingredients, and the reviews that follow reflect this attitude. Each of the following categories has its own chapter: chips, dips and party foods; ice cream and other frozen treats; cookies; chocolate; cakes and other desserts; granola bars and other on-the-go snacks; candy; and soda and other drinks. In each category, name-brand products are compared against each other. Food labels are picked apart one ingredient at a time, and the unhealthiest ingredients are bolded in color to make them stand out. One product is given a bad choice rating, while that other receives the naturally savvy pick as the superior product. Annotations talk about the negative ingredients in the bad choice which brought about that rating, while letting you know why the savvy pick was given that distinction. The approval includes a short justification as to why that product is superior. This book can be a valuable guide in helping the consumer to make healthier choices when buying junk food. It is important to remember that one can get a false sense of healthy eating when evaluating each product; in realty all the foods included in the book have minimal or negative health value. If you keep that in mind, Unjunk Your Junk Food can be a positive when trying to eat better in the nutritional mine field known as junk food. Big changes are brewing 'round here. Stay tuned to see what is in store! Like what you see? Subscribe using your RSS reader!